Reviews & Excerpts | Do You Believe in Vampires? 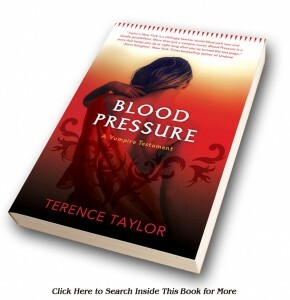 Taylor mingles traditional vampire lore with the story of a relationship in trouble. New Yorkers Stephen and Lori, an artist and a writer, are breaking up badly while having to deliver a contracted coffee-table book on vampires. Concurrently, a brutal vampire kills a young woman, brings her back to life, and forces her to feed on her baby. The vampire baby escapes, putting all of New York’s vampires at risk. Stephen and Lori blunder on the truth about the baby, reluctantly ally with those who think dead humans can spill no vampire secrets, and wind up battling monsters and dealing with highly intensified emotions simultaneously. 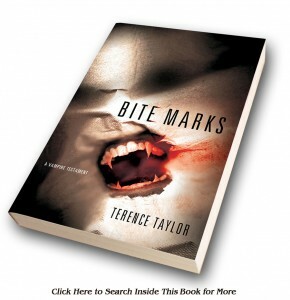 This is a vampire novel worth reading. Christopher had never been sick a day in his life. It was a running joke in the family. There wasn’t one kid or parent they hadn’t carried to the emergency room in the middle of the night, at one time or another, except Christopher. They’d made jokes about his good health all through his childhood, had even accused him of bringing a few family pets back to life before they could be buried. They made jokes, the neighbors made jokes, teachers made jokes, but beneath all the laughter was something darker. The second Vampire Testament is set in New York a generation after the end of Bite Marks (2009). Christopher Turner, the baby saved at Bite Marks’ end, comes to the Apple for answers about his past. He meets Joie, Stephen and Lori’s daughter, and with her discovers that, working together, they have the power to cure vampires. But there are many who value their vampire powers and don’t wish to be cured. There is also a covert ops organization bent on ridding the world of vampires before they take over key governments—but can its leader be trusted? With plenty of action and intrigue, plus a fair bit of erotica, the yarn also has some sharply written sequences concerned with the value of choice and taking responsibility and is Taylor’s tribute to Zora Neale Hurston, who is a key character. Should certainly please seekers of imaginative, skillfully executed vampire stories.